Playwright Theresa Rebeck’s amusing trifle – for that’s really all it is – concerns a struggling, sarcastically embittered actor named Harry (Justin Kirk) rehearsing a fictional Franz Kafka rediscovery with B-level action film performer Jake (Mark-Paul Gosselaar) for whom Harry’s the standby. Frazzled stage manager Roxanne (Julie White), is on hand to make sure they stay on script while she supervises the lighting and set change cues. She was once engaged to Harry, but he jilted her a couple of weeks before their planned wedding. Already stressed by the stoned set technician Laura consistently missing her cues, she is further unhinged by his return and still evidently carries a torch. Jake is, in turn, the understudy to the production’s leading man, a bigger film star called Bruce. At one point, the no-nonsense Roxanne puts Harry in his place by clarifying the pecking order: the unseen Bruce is Richard III, Jake is Henry V, and Harry a mere spear carrier. Realistically speaking, though, would Jake, as the co-star, really be understudying Bruce? That’s just one aspect of several that strain credulity, such as Jake at first mistaking Harry for an intruder. And then, when learning that Harry’s the understudy, complaining it should be someone of greater stature. Why would that be? 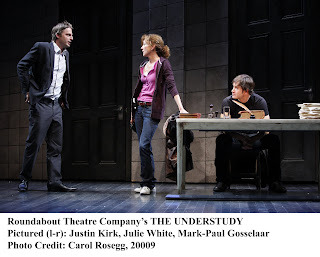 “The Understudy” premiered in July of 2008 at the Williamstown Theatre Festival. 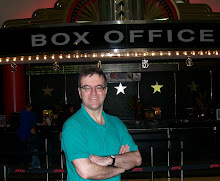 Rebeck cleverly makes connections between a Kafkaesque world and the similarly illogical nature of show biz, with existential elements providing humorous fodder, along with jibes at Hollywood stars and show business. For instance, a casting agent has told Harry he didn’t exist. Harry and Jake ponder the “meaning” of the prop bananas which they chow down while Roxanne is out of sight. I didn’t find this quite as uproariously funny as those sitting around me, but there are laughs aplenty, many courtesy of White who is a riot, compulsively playing with her hair, bitching as she storms up and down the aisles of the theater. The men are terrific, too: likable Gosselaar as the strutting (but sensitive and actually insecure) film actor who clearly relishes his big chance to do High Art on Broadway and enthusing about Kafka, and Kirk – who sets the mood with his manic opening monologue – playing his sardonic role to a tee. Alexander Dodge’s set – various Kafka-inspired backdrops weaving in and out at all the wrong moments – adds visual amusement. Scott Ellis directs the funny bits expertly and brings out Rebeck’s underlying poignancy, which ultimately seems to give the play more substance.